Its official, the Spodak Dental Group is now LEED Gold Certified. The new signage (created by our Studio) just went up today, explaining all aspects of the green building and landscape. If you are in the Delray Beach area definitely check it out and maybe get your teeth cleaned while you are there… There will also be an AIA and USGBC tour of the building on June 11th. The new home of the Spodak Dental Group is envisioned as an environmentally sound holistic building and landscape that provides comfort to patients, inspires staff and creates an open and transparent facility. 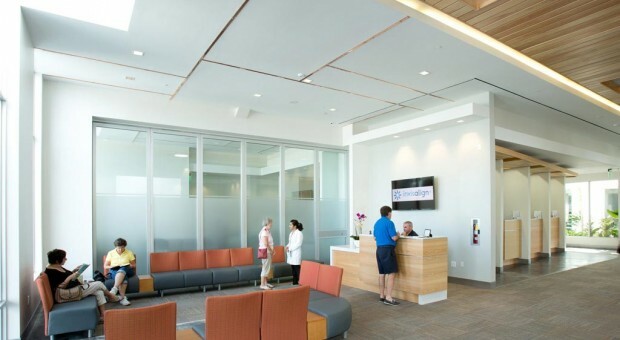 The 13,000 square foot LEED Gold building provides space for 18 dental operatories, laboratory space, offices, gathering spaces, a learning center, a waiting area and support spaces. The building design is centered around one main goal: creating abundant natural lighting and indoor spaces that feel a part of the surrounding gardens through large expanses of transparent walls. Every operatory has a vertical expanse of glass from floor-to-ceiling, three areas have full floor-to-ceiling glass that wrap to the roof. Solatubes provide natural light for enclosed interior spaces. The goal of transparency drives the modern and minimalist architectural design with an emphasis on light, shadow and lush vegetation. The building shell utilizes functional concrete construction and expresses cast-in-place concrete columns, lintels and select walls as visual extensions of the façades, contrasting with the white stucco base finish. The west façade is designed with large overhangs and an extensive shade trellis that extend from the building and create patterns of shadow while protecting the interior from direct sunlight. A specialty detail of patterned relief in both the stucco and cast-in-place walls is utilized to create shadow line variations enhanced with linear copper accents. These linear copper details are also reflected in the ceiling within the building.